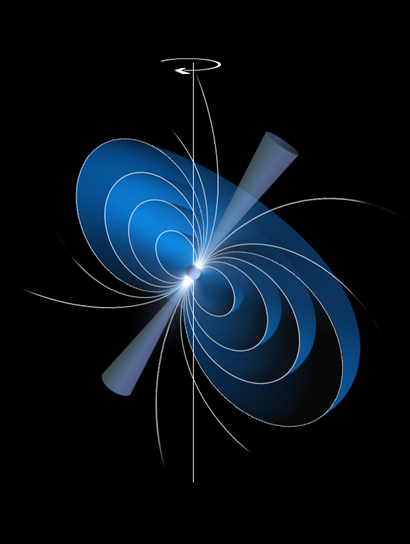 This illustration shows a pulsar with glowing 'hot-spots' that are located at its magnetic poles, the likely sites of X-ray emission from old pulsars. In particular, the illustration shows the pulsar in a state characterised by bright X-ray emission, arising from the polar caps, and relatively low radio emission from the cones that stem from the pulsar's magnetic poles ('X-ray-bright/radio-quiet' mode). Pulsars were discovered in 1967 as flickering sources of radio waves and soon after interpreted as rapidly rotating and strongly magnetised neutron stars. There is a general agreement about the origin of the radio emission from pulsars: it is caused by highly energetic electrons, positrons and ions moving along the field lines of the pulsar's magnetic field. When they are accelerated to very high energies, particles radiate at radio wavelengths. The radio emission is concentrated in cones that stem from the pulsar's magnetic poles, and we see it pulsate because the rotation and magnetic axes are misaligned. Many pulsars exhibit a rather erratic behaviour: in the space of a few seconds, their radio emission becomes weaker or even disappears for a while, then returns to the previous level after some hours. The mechanisms causing this switch between what are usually referred to as 'radio-bright' and 'radio-quiet' states are still largely unknown. When they are young, pulsars also shine in X-rays because the surface of the neutron star is still very hot. Old pulsars are much weaker sources of X-rays, because the surface of the neutron star has cooled down. Astronomers know of only a handful of old pulsars that shine in X-rays and believe that this emission comes from the magnetic poles – the sites on the neutron star's surface where the acceleration of charged particles is triggered. Observations of the five-million year-old pulsar known as PSR B0943+10, performed simultaneously with ESA's XMM-Newton X-ray observatory and ground-based radio telescopes, revealed that this source exhibits variations in its X-ray emission that mimic in reverse the changes seen in radio waves. No current model is able to predict what could cause such sudden and drastic changes to the pulsar's entire magnetosphere and result in such a curious emission.